1.3 Integration with other pain treatment approaches. The term electrotherapy and electrophyical agents have been used interchangeably to describe the modalities used in physiotherapy. Some suggest that the term electrotherapy implies modalities that use electric current only in treatment. 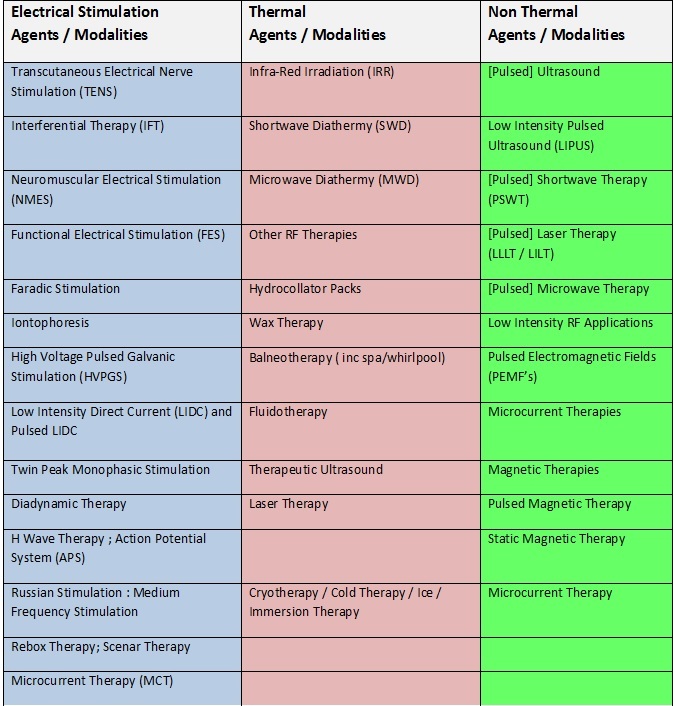 Electrical stimulation agents and thermal agents are the most used in physiotherapy pain management. However, non-thermal agents, such as pulsed ultrasound, have been reported as having an analgesic effect. The exact mechanism of electrical stimulation’s beneficial effect remains controversial. Electrical stimulation is said directly block pain signals from reaching the brain so that the patient never experiences them. In addition, electrical stimulation has been shown to promote the release of endorphins which are natural painkillers produced by the body.Pain reduction occurs because the applied electrical fields act to close the body's "pain gate mechanism"TENS ( Transcutaneous Electrical Nerve Stimulation) is the widely used electical modality for chronic pain. There is moderate evidence that heat therapy reduces pain and disability for patients with back pain that lasts for less than three months. The relief has only been shown to occur for a short time and the effect is relatively small. The addition of exercise to heat wrap therapy appears to provide additional benefit. There is still not enough evidence about the effect of the application of cold for low-back pain of any duration, or for heat for back pain that lasts longer than three months. Manual therapy is frequently used by physiotherapists, to assist with the treatment of pain. The following video is a useful literature review, based on the Cochrane report by Anita Gross in 2015. A detailed explaination of Mobilisation and its effect on pain can be read on this Physiopedia page: Maitlands Mobilisations There is no convincing evidence indicating whether mobiisations or manipulation are more effective than each other. However regardless of this there is indication that neither of these therapies should be used in isolation, but as part of a wider treatment plan, mainly involving exercise. "Spinal Manipulative Therapy (SMT) is no more effective in participants with acute low-back pain than inert interventions, sham SMT, or when added to another intervention. SMT also appears to be no better than other recommended therapies." However, there is other work such as Bronfort et al that suggests Manipulation is a useful tool in the treatment of Low back pain. "We have very little confidence that massage is an effective treatment for LBP. Acute, sub-acute and chronic LBP had improvements in pain outcomes with massage only in the short-term follow-up. Functional improvement was observed in participants with sub-acute and chronic LBP when compared with inactive controls, but only for the short-term follow-up"
Acupuncture is widely used by physiotherapist for the management of pain. There is much that we still need to understand about its exact mechanisms, however patients often report anecdotal evidence of its benefits. Take a look at this physiopedia page on Acupuncture. The introduction of the acupuncture needle produces a numb, aching sensation called "DE QI" that is thought to be esssential for the effectiveness of the treatment. It is thought that this sensation contributes to the activation of the endogenous antinociceptive system. Bowsher(98) and Wang(85)theorised that De Qi is due to the activation of A delta fibres type I and III and the C-fibres releasing opioids in the dorsal horn. Despite acupuncture being widely used and reported as being helpful, it is disappointing that there is a lack of evidence to support this. There are other reports that indicate that the evidence base for acupuncture is widening however such as this report by Ernst. Integration with other pain treatment approaches. Traditional Physiotherapy pain modalities can be integrated with other pain approaches i.e Pharmacological,Psychological,Exercise and Behavioural.There is little to no evidence on this subjcect more reasearch is warranted. ↑ Yousefi‐Nooraie R, Schonstein E, Heidari K, Rashidian A, Pennick V, Akbari‐Kamrani M, Irani S, Shakiba B, Mortaz Hejri S, Jonaidi AR, Mortaz‐Hedjri S. Low level laser therapy for nonspecific low‐back pain. The Cochrane Library. ↑ Bronfort G1, Haas M, Evans RL, Bouter LM.Efficacy of spinal manipulation and mobilization for low back pain and neck pain: a systematic review and best evidence synthesis.Spine J. 2004 May-Jun;4(3):335-56.